Vendor Directory / JDETIPS, INC.
Our mission is to help JD Edwards clients and their employees become more effective and efficient through superior JDE education. 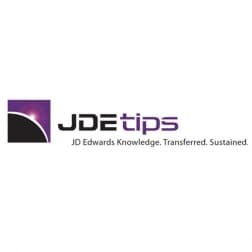 JDEtips is a closely-knit team of educators, editors, consultants, and business professionals. The company began in 1998 and has grown to become a highly respected North American JD Edwards training and consulting practice.